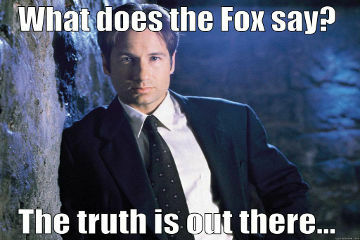 If you’re like Fox Mulder, you believe the truth is out there. That’s great and all, but what happens if you’re not fast enough to read it when “the truth” finally whizzes by? That’s the sort of problem astronomers have faced since 2006, when the first “fast radio burst” (or FRB) was detected in radio telescope data recorded five years earlier. Poring over archived pulsar survey data, they found a brief spike in the signal across a range of wavelengths. It lasted less than five milliseconds, quick as a Ruby Rhod *bzzzzzz*. And then it was gone. That may seem weird. But pulsar-hunting astronomers are used to this sort of now-you-see-it, now-you-don’t radio signal Whack-a-Mole. Pulsars are rapidly spinning neutron stars that emit radio signals, and their twirling makes the detectable signal come and go at regular intervals. Only with this particular fast radio burst, it came once… and it never came back. Kind of like Jesus. Or Nelson Muntz’s dad. Oh, no, wait. Nelson’s dad did come back eventually. Scratch him. That was just the beginning of the mystery, though. The spread of the signal across wavelengths suggested that this fast radio burst had traveled across space and through interstellar gas, which can spread signal out, the way a prism does with light. Based on the spread, astronomers calculated that the signal had come from more than five billion light years away. Which meant whatever had created it must have been ginormously powerful, for the signal to make it so far through the cosmos. That opened up a whole new can of WTFs. So far as we can tell — meaning as far as we can see with our various telescoping gadgets — there’s nothing in the region where the fast radio burst came from. No stars. No black holes. No outposts with Marvin the Martian plotting our destruction. Nada. If there’s something — or somethings — there, we’re not able to see it with our equipment. And we have no idea why it would scream at volume 11 for an instant, and then stop seemingly forever. I mean, sure — Obi-Wan would tell you it was Alderaan. But what does he know? He doesn’t have an astrophysics degree. The first fast radio burst was weird enough to make people skeptical. When we didn’t see another one for a few years — and when one team discovered they could make similar signals by opening a microwave door just right — astronomers wondered whether it was a technical glitch. Flying bird farts. Space voodoo. Something. But in the past few years, ten more fast radio bursts have been detected. Now, there’s corroboration from a second radio telescope — and the last one, in 2014, was detected live as it happened. Now, scientists calculate that if we could point radio telescopes at the entire sky, full-time, we’d see hundreds — maybe even ten thousand — of these fast radio bursts per day. That still doesn’t tell us what causes them — but there are some pretty cool theories. Each source is calculated to be no more than a few hundred kilometers wide, so these big (and quick) things are coming from some pretty celestially small packages. Some think it might be colliding black holes, or neutron stars collapsing together. Or black holes exploding, if that can even happen. Others blame them on blitzars — though why we have to bring Santa’s reindeer into this, I don’t know. We’re trying to do real science over here. Whatever it is making fast radio bursts, astronomers are now agreed that they exist and are doggedly looking for more. Someday, with enough evidence, no doubt they’ll finally find “the truth” behind these weird astronomical aberrations. Or they’ll find the Death Star. And I’m pretty sure Mulder wasn’t looking for that. National Geographic – Mathematical pattern found in enigmatic radio bursts, but it’s not E.T. UBC Science – Could fast radio bursts help astronomers chart the cosmos in 3D?